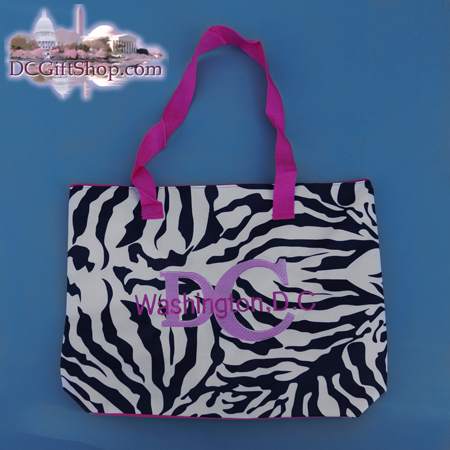 For residents, visitors or anyone who wants to show their true colors, DC Gift Shop is now offering this nice accessory for our women customers: the DC Zebra Print tote bag. With a pink zipper, pink handles and a bold Washington, DC embroidered graphic, this bag is sure to make any fashionista the talk of the town. Spacious and roomy, this bag can accommodate anything you want to carry at 17 inches across, 15 inches tall and 3 inches wide, it is the ultimate tote, grocery or beach bag.